We all are familiar with Facebook and it acts like entertainment in our day to day life. Facebook is trying to make users life joyful. Many people post their everyday activities in this social media platform. Facebook always try to add some new features. Recently, they were busy with their live videos which became very popular in a short while. And now its Purple Bird Trending. 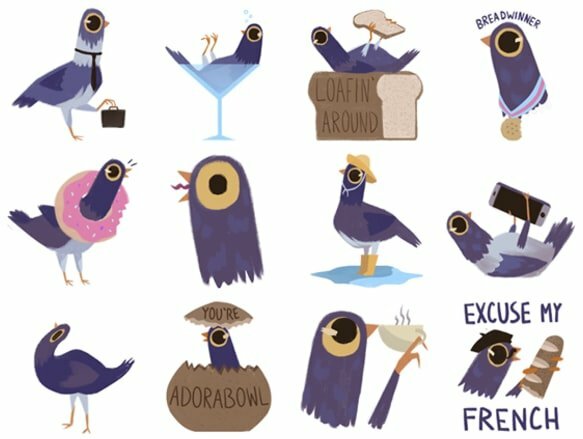 Now, Facebook has added a user sticker of a great purple bird. In these days the Facebook page is packed with this sticker. These purple birds are called Trash Doves which is very popular nowadays. It became meme-worthy in a very short time. This is a GIF sticker which is doing a variety of performance we do in our daily life. Such as talking in mobile phone, crying and carrying donut around its neck. There are many GIF, pictures which didn’t take the time to go viral and now Trash Doves is one of those. Know Your Meme states that Florida Artist Syd Weller has invented the Trash Dove and it is presented by Facebook in the month of January. The Thai internet has made the news of purple bird viral. This news was spread in the last Wednesday by the Thailand. In an interview with PopDust, Syd Weiler said that this news was widespread from Thailand. It started from a gag regarding the birds. A GIF was viral in which a pigeon is hitting his head and this GIF soon became famous. If you search Facebook then you will notice many results extent from individual trash dove memes to genuine pages like Trash Dove Conquer The World, Trash Dove Memes, and much more. The curiosity and excitement of people were recognized when they started making trash dove- motivated pins, makeup, cookies and lots lot more. The Verge reports that Syd Welled created an exclusive Trash Dove GIF for showing appreciation to the Thailand because they made that simple sticker so popular. Till now the exact reason of making the Trash Dove popular is not revealed, but we can claim that the latest GIF of the Facebook is very trendy.